This week, the Medical Academy of Pediatric Special Needs held its semiannual conference in downtown Atlanta, GA. This is ‘Ground 0’ for practitioners, researchers and professors from all over the world to meet, learn, explore and discuss a myriad of relevant topics. Members who have been returning for 100’s of lecture hours generally choose the advanced courses. For some, the conference has become a group of ~50 experienced and knowledgeable practitioners who meet to discuss ‘workups’, basic science, relevant research and treatment protocols for those who are most affected with ASD. I really enjoyed our lectures by the plain-speaking Dr. John Green, of Portland, OR. Dr. Green not only reviewed those who improved because of his medical expertise, but those who got better in spite of him, those who haven’t gotten better, those who got better but he can’t figure out why, and the most frustrating – patients who improve only to suffer frequent relapses. Dr. Sid Baker, a pioneer of the biomedical movement, described his early medical experiences in Africa that morphed into his lifelong dedication to treating patients with ASD. He expressed his disappointment that so many conventional colleagues disagree with our practice. Dr. Baker elucidated how he initiates care with new patients. He discussed increasingly resistant cases, covering topics from severe speech apraxia to the approach to children with injurious behaviors. The first day was filled with the most frustrating and difficult cases you can imagine. Eminent practitioners Drs. James Neuenshwander, Michael Elice, and Julie Buckley challenged our diagnostic and therapeutic knowledge, attempting to navigate the complicated courses of those who improved and those who didn’t. Dr. Daniel Amen‘s morning lecture was entitled “3D Brain SPECT Imaging”. 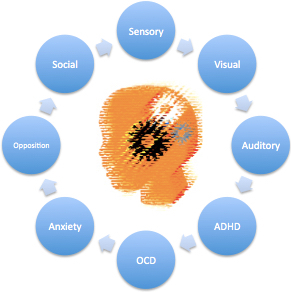 The takeaway message was that SPECT scans – technology – could/should/will become a mainstay for a multitude of CNS disorders. His manner and stories of research, technical evaluation, and clinical practice, were positively spellbinding and inspirational. Dr. Theoharides presented his research and extensive knowledge about the important role of allergy in ASD. Dr. Theo continues to publish a mountain of monumental works, not only on the topics of autism and the role of mast cells, but treatments, as well. Toxins were the subject of the afternoon’s lectures. We learned about the identification of substances in the environment that are dangerous, how they are measured, how damage is done, and the means to control and treat. For the skeptical reader, there was a plethora of supporting scientific evidence of the relationships to autism (and many other modern conditions). As has become customary, Dr. Dan Rossignol rounded up the day with a roundup of all of the latest scientific research. Rapidly. Severe behaviors and speech apraxia. For patients who are most resistant to conventional and alternative treatments, essential oils, acupuncture, and even worms were explored as possible solutions. Throughout the afternoon, cases got even tougher! Lyme, Persistent Lyme, Non-Lyme Lyme, PANDAS, PANS, parasites… an increasing number of reasons to have signs and symptoms that are called autism. Such information extends our knowledge and leads to better diagnoses for our patients, and possibilities for treatment. Dr. Green discussed biomarkers. 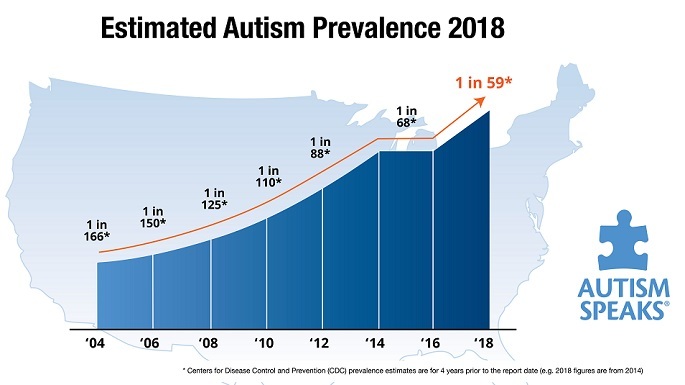 Though these ‘labs’ are not specific to ASD, per se, this will become a necessary next step to document level of involvement and response to treatments. A brand new treatment, repetitive Transcranial Magnetic Stimulation was presented by Dr. Arun Mukherjee. The jury is still out on this expensive intervention. One important reason that I return to this meeting, is simply that I feel at home among like-thinking practitioners. Members don’t agree on every subject, but we are respectful and actually enjoy our practices. In traditional medicine, conferences are basically show-and-tell affairs, where researchers report their data, previously published in medical journals. When doctors think outside the box, practitioners with diverse skills, who are scattered over the globe, discover improved results by networking in this fashion. Patients, parents, and families can feel confident that progress is being made (slowly), as serious, dedicated doctors continue to try to unravel this modern mystery. Finally, I am proud to report that, at this meeting, I was awarded Fellowship status in the Medical Academy of Pediatric Special Needs. A disease described forty years ago due to a cluster of patients who appeared in the vicinity of Lyme, CT, has to be considered among the list of differential diagnoses when pediatric patients present with unusual developmental and other complaints. Included on that list are PANDAS, specific neurologic disorders (e.g. seizures and cerebral palsy), chromosomal anomalies, mitochondrial disorders, and a myriad of systemic conditions, such as autoimmune ailments, G-I disease and skin rashes that ultimately may lead to symptoms and signs that fulfill criteria for ASD. There is a complicated life cycle involving a deer tick that is infected with an unusual bacterial organism. When a human is bitten, those critters create problems throughout the human body. The variety of symptoms are due to effects in multiple organ systems, including skin, internal organs, muscles, and neurons throughout the body. Fatigue and various CNS complaints are the most obvious and serious signs. In patients with ASD, Lyme may appear as regression or progression of aggressive and disruptive behaviors. Recent recognition of the havoc that this infection wreaks on the immune system points to signs and symptoms in a number of modern autoimmune maladies. The most reliable diagnosis is made when a two step protocol is positive. Using the same sample, a positive or equivocal enzyme test will lead to testing for specific antibodies. 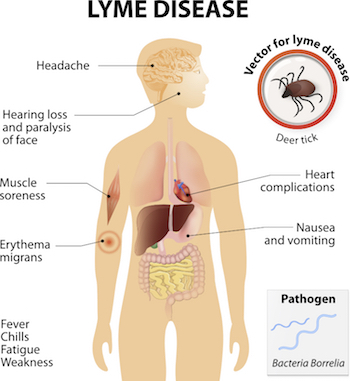 According to one commercial laboratory, their PCR test has the advantages of correctly identifying Lyme in small measure, and in a variety of tissues. Costs are approximately $300 to $800. Unless there is specific and adequate documentation, insurance companies balk at paying for even the less expensive labs. Patients treated with appropriate common oral, or intravenous antibiotics in the early stages of Lyme disease usually recover. There is a controversy concerning the proper diagnosis of patients who fail to respond after 6 months. The CDC prefers “Post-treatment Lyme Disease Syndrome” to the term, ‘Chronic Lyme Disease‘. There is also “Conventional medicine and the NIH have taken a particularly strong position, researching various treatment protocols with little evidence of value. However, those who continue to suffer seek additional relief. When faced with the enigmatic and vague diagnosis of ‘Spectrum Disorder’, parents sometimes seek a more specific, treatable disorder, such as Lyme. Clinicians should elicit a history of possible exposure to infected blacklegged ticks. Though ASD patients are as likely as anyone to become infected, symptoms that begin in infancy and very early childhood are much less likely due to Borrelia. The history, a particular rash, and an unrelenting deterioration of neurologic function should alert the astute physician to perform the appropriate laboratory testing. Importantly, the information we learn from studying and treating Lyme disease has many similarities to our better understanding of autism, as well.